Painting or staining wood veneer on furniture or cabinets is a great way to change the color to suit your home decor. Unlike solid wood, wood veneer is delicately thin and can be easily chipped and damaged if subject to aggressive sanding and stripping, so extra care is required in refinishing a wood veneer piece. Clean the wood with a solution of Trisodium phosphate (TSP) to remove grease and dirt. Repair any loose pieces of veneer with woodworking glue and let them dry thoroughly. For staining a wood veneer, apply the paint stripper as per the manufacturer's instructions and scrape off any existing finish. Alternatively, carefully sand the veneer with 150-grit sandpaper until the existing finish has been removed. Sand the wood with 200-grit sandpaper for a final smooth finish. 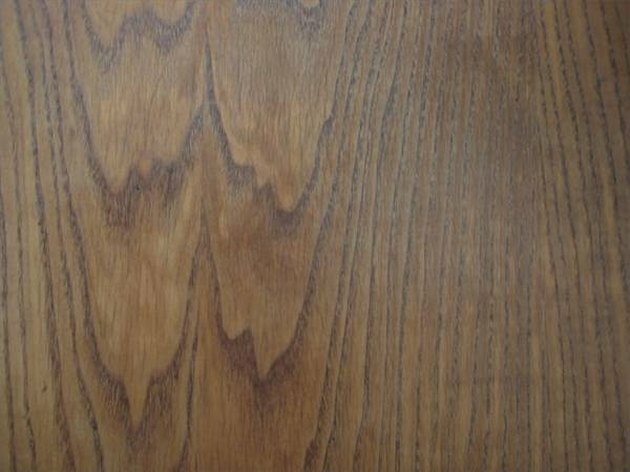 For painting a wood veneer, sand the surface with 150-grit sandpaper until the existing finish is dulled. Dust off the item. Sand the veneer with 220-grit sandpaper for a final smooth finish. Paint the first coat of stain or paint onto the wood with a good-quality brush. Let it dry as per the paint or stain manufacturer's instructions. Sand the wood lightly with 220-grit sandpaper. Paint the second coat of stain or paint onto the wood veneer. This coat should be lighter than the original coat. Let it dry as per the manufacturer's instructions before use. Linda Wong is a freelance writer located in Los Angeles, Calif., with a degree in architecture from the University of Auckland. She specializes in a broad range of project types, including residential and commercial buildings, plus interior and furniture design. Wong has been a Demand Studios writer since 2009, and her articles focus on home improvement and design topics.